How come no one applied to my job posting? Last time I provided some tips to help you create more effective job postings to attract more and better talent. This time I’m going to talk to you about what not to do, as it is very easy to make some simple mistakes that can prevent people from applying to or even reading your job posting. If your job posting is something you scraped together from previous job postings, then it’s probably not specific. If your posting isn’t specific and tailored to the job, then it’s going to be dull. If your posting is dull then why would be anyone be excited to apply for it? A huge pitfall of many job postings is that they come across reading like an instruction manual. You need to make the person excited to work with you and the first step is by having an interesting and not a run-of-the mill posting. A lot of companies like to use fun names for their positions, such as Apple’s use of “Genius” when they are actually referring to a “Service Technician.” These are great for internal use, but they are not so great when you are looking for someone new. This speaks to the search engine optimization (SEO) of your job posting. You need to use words and titles that people are more likely to search for when they are looking for a job so that your posting comes up higher in search results. People tend to scan through job posts before reading them. If your posting is a bunch of long blocky paragraphs, then they aren’t very likely to go back read through them. Make your key points easy to read with bullet points and keep paragraphs short, 3-4 sentences max. The key information that people first look for is the company, the title and the location. These things all need to be easy to find and easy to read. Don’t bury them in a paragraph; either give them their own bullets or put them in the opening sentence. It’s shocking how often postings don’t have any sort of call to action telling the candidate how to apply or what is needed to apply for the position. A line at the end with an email address works well, i.e. “Email HR@yourcompany.com with a resume and cover letter to apply.” Also if you require a cover letter, make sure you say that. But on the reverse end, don’t make your candidate go through the effort of writing a cover letter if you aren’t going to read it. Want to learn more? 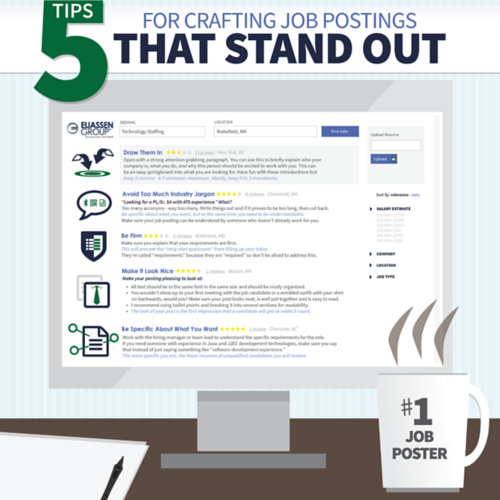 Check out our infographic, “5 Tips for Crafting Just Postings That Stand Out.” And don’t hesitate to send us any questions you have about developing strong, effective job posts: solutions@eliassen.com.